8.04 points at 27 votes (rank 76). 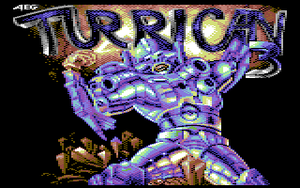 Special for this Turrican are the ingame sounds. And they are really good. 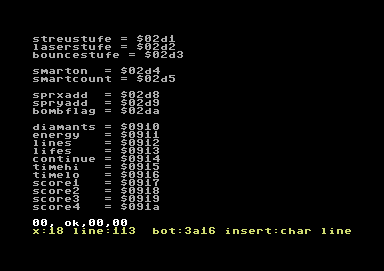 The hero is steered through 11 levels by joystick in controlport 2 and the keyboard. 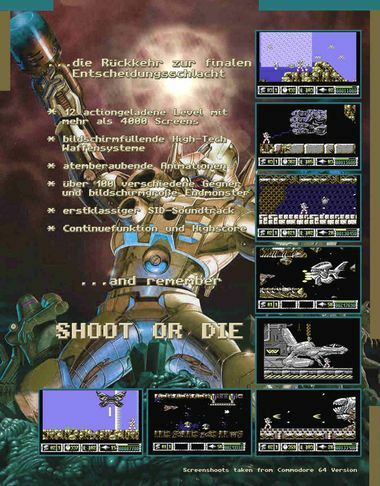 Turrican has 3 normal weapon systems, the multiple scatter shot, the laser and the bounce shot. These can be activated or upgraded by extras that fly around or are hidden inside bonus blocks. Additionally, there are the bonus weapons. By pressing the fire button (joystick) for a long time, the surround flash is activated and also works in a crouch. The surround flash can be enlarged by picking up extras. With the space key you activate power lines, which are limited but can be filled up with extras. If you pull down the joystick and press the space key, Turrican turns into a wheel and can go on shooting by pressing the joystick fire button. With the CTRL key the game is paused. Unfortunately, there are still some bugs in the program. 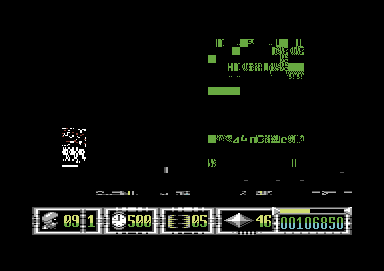 The screen flickers when many sprites are shown at the same time (all levels). You can get stuck in the background (levels 1+2). The collision query is partially very inaccurate (levels 1+2). The place where you appear can be a wall (level 2) or a hole (level 4) (the effect is the same, you die right after appearing until all lives are used up). 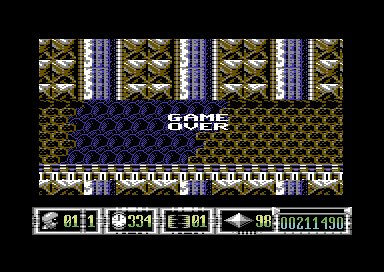 Turrican does not appear at all after dying although you still have lives left (level 5). And partially you can get a complete crash (especially when facing the end bosses in level 1+2 you should not jump or the graphics crash). However: Congrats Smash Designs !! The gyro has its advantages: In this shape you are invisible for your enemies, you can leave this form while in midair and make a jump onto a rock spur, which else would not be feasible, furthermore you are faster in gyroscope shape. Sometimes it is better not to follow the jumps of the enemies and stay at the same place. 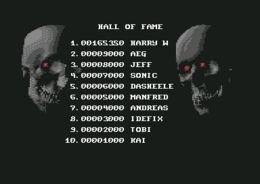 Often there are places where you are relatively safe from the level bosses. For other enemies it is already enough to go back again until the screen scrolls and then forward again. The enemies have then blown over. But beware: also 1-ups, diamonds and bonus blocks will disappear this way. As you can only carry 5-7 power lines you should use them regularly, what else do you have them for? And as always you should collect as many diamonds as possible, as 100 diamonds get you one continue. What a pity that AEG hasn't build in a cheat. In the source code the following storage locations are named, which can be manipulated with the integrated monitor in WinVICE. In storage location $0913 there is the number for available lives. You can raise it to $99 (99 lives) with the help of a cartridge or an emulator. In storage location $0914 the number of available continues is stored. You can raise it to $09 (9 continues) with the help of a cartridge or an emulator. Logan: "Up to level 3-1 the game is fun. Then it gets too hard for me. And the levels 4-1 to 5-2 are to linear for my taste." 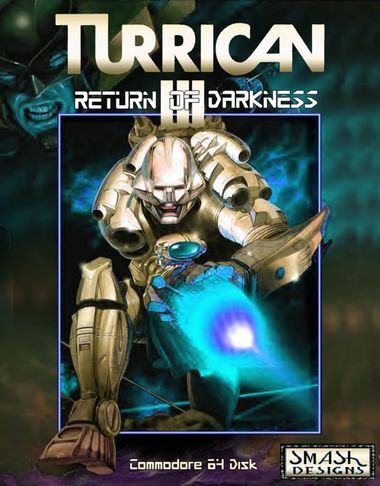 Turrican III is Open Source. The source release can be found on the homepage start page of Smash-Designs in the entry from the 06.09.2004.